Madison, Wisconsin runner Becky Pelnar (28) has overcome injury to run - and has her sights set on improving her marathon time. Pelnar has completed six Half Madison Marathons and is training for her first Full Madison Marathon on November 9. Focal Flame Photography, the official race photography firm for the 2014 Madison Marathon events, asked her about why she runs. 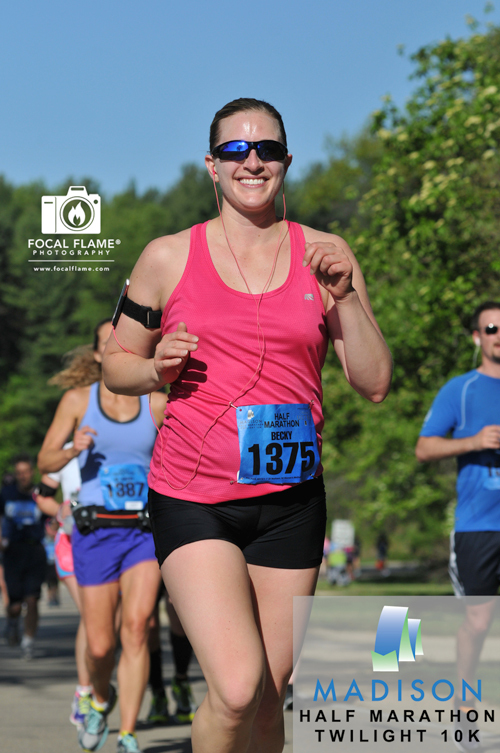 Focal Flame Photography (FFP): How many total marathons or half marathons have you run? Becky Pelnar: One full marathon and nine half marathons. FFP: Have you participated in other events aside from the Madison Marathon? Becky: I have run the Haunted Hustle, Tough Mudder, Warrior Dash, Ugly Sweater 5K, and Electric Run 5K. Becky: I trained for the Madison Marathon in May 2012, but it was cancelled due to the heat so I ran the half instead. During my training I developed Achilles problems, but I still signed up for the Haunted Hustle Marathon that October. Due to my injury I did not train at all but still ran the entire Haunted Hustle and managed to finish under 5 hours (not great, but not terrible for my first full marathon, especially with a lack of training). I'm running the Madison Marathon this November to try to get a better time! Becky: All it takes is one race to get someone hooked. The adrenaline, the excitement and camaraderie from fellow racers, and the support from spectators can be all the motivation someone needs to participate in a race. For me, I love getting to run through my hometown here in Madison, seeing familiar faces and places along the way. I get to support my city while feeling an amazing sense of accomplishment and pride at the same time. FFP: With so many races to choose from, what makes the Madison Marathon special? Becky: I love starting and ending at the Capitol! I think overall the course showcases some of the best features of Madison — the Arboretum, Governor's Mansion, Monroe Street, etc. Becky: I always tell people, if I can run a race, ANYONE can. I never used to be a runner, but all it takes is pushing yourself a little further and further each time. You just need to remember to relax, enjoy the scenery as you go, and smile. This article is part of a series featuring athletes who are participating in the Madison Half Marathon or Madison Marathon on November 9, 2014. For more information or to register, visit Madison Marathon.